Cradlepoint devices provide wireless backup of wired Internet connections for retail superstores in the Blinds To Go system. In the event of an outage of the primary Internet land line (T1/fi ber, DSL, or cable) at a Blinds To Go site, Cradlepoint devices automatically switch to its wireless 3G/4G broadband connection within 30 seconds. 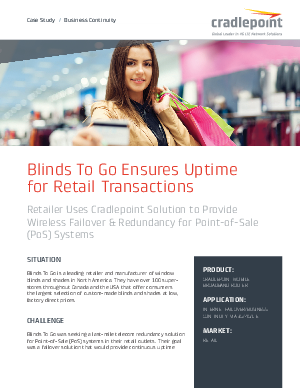 The point-of-sale (POS) systems connected to the Cradlepoint router continue to operate at broadband speeds without further interruption, ensuring continuous uptime for POS transactions at the Blinds To Go superstore.